Orbotix’s popular Sphero rolling robot has a new friend. Ollie was launched last fall and we’re happy to now have it in the Shed. 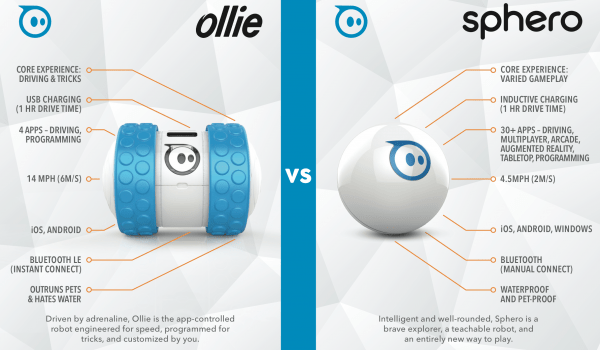 You may be wondering what the differences are between Sphero and Ollie. Let’s take a closer look. The first-of-it’s-kind Sphero trumped many of the Bluetooth-enabled robots out there, taking gaming and action to a new level with its programmable iOS-connected platform. Not only is it a great toy for adults, it’s also a super learning tool for kids. Ollie combines everything that’s great with Sphero and amps it up a notch. The new bot is made for speed and tricks. One noticeable difference is the shape. Ollie has a broader platform designed for all-terrain action and comes with interchangeable wheels. It can also drift without its tire covers and clock speeds up to 14 mph. And the new Bluetooth BLE connection makes for fast, hassle-free syncing and a range up to 98 feet. Ollie is still new and has room to grow with apps and such, while Sphero seems to be fairly abundant in that realm. Either way, you can expect to have fun with your new interactive robot while learning the basics of programming. Jump over to the Maker Shed to get your own!